This article is about the game. For the Halo 5: Guardians medal, see Combat Evolved (medal). "Halo: Combat Evolved! Buy one! Heck, buy two! That's an order, soldier!" Halo: Combat Evolved is a 2001 first-person shooter science-fiction video game developed by Bungie Studios and the first game in the Halo series. It focuses on John-117 and the crew of the UNSC Pillar of Autumn who, fleeing from the Fall of Reach, stumble on the Forerunner Halo Installation 04, only to be forced into a desperate battle against the Covenant and the Flood. Considered a classic, Combat Evolved is one of the most popular video games for the Xbox with eight million copies sold. Its sales are rivaled only by its sequels, Halo 2 and Halo 3. Halo: Combat Evolved has been made available as an Xbox Original game title for Xbox 360 since December 4, 2007 for download on Xbox Live Marketplace for 1200 Microsoft Points. It was also released for PC and Mac. The game was remastered as Halo: Combat Evolved Anniversary and was released on the original game's tenth anniversary on November 15, 2011 for the Xbox 360. Along with Halo 2: Anniversary, Halo 3, and Halo 4, Halo: Combat Evolved Anniversary was released on the Xbox One as part of Halo: The Master Chief Collection on November 11, 2014. Halo: The Master Chief Collection also features the multiplayer component of Combat Evolved, with online play enabled on dedicated servers. Halo's storyline is linear; there is a single ending in contrast to other first person shooters such as Deus Ex that could have several different endings. The storyline is presented to the player through an instruction manual, scripted events and conversations during the game, and a number of cut-scenes rendered using the game's graphics engine. This method of storyline delivery is common among modern video games. The Xbox version of Halo: Combat Evolved allows one player to play the campaign alone, as well as allowing two players to play through the campaign in split screen. The PC version of Halo: Combat Evolved allows only one player to play through the campaign. Halo: Combat Evolved begins with the UNSC Pillar of Autumn emerging out of slipspace after the Fall of Reach, only to find a huge ring world—a "Halo"—floating in space. Master Chief Petty Officer John-117 (although his name is never mentioned throughout the game), a SPARTAN-II, is aboard the Pillar of Autumn when the ship comes under attack by the Covenant, a religious alliance of aliens and the archenemy of humanity. With the ship about to be overrun, Captain Jacob Keyes, the commander of the Autumn, orders John-117 to protect the ship's artificial intelligence, Cortana. She carries highly sensitive information about the United Nations Space Command, including the location of Earth, which would prove disastrous if captured by the Covenant. John-117 evacuates the doomed ship for the surface of Halo to protect Cortana. With the UNSC Marines by his side, Cortana providing direction, and his assault rifle ready and loaded, John-117 sets out to uncover the mysteries of Halo and fight the Covenant. After meeting up with surviving UNSC forces under Staff Sergeant Avery Johnson, John-117 participates in a mission to rescue Captain Keyes from the Covenant cruiser Truth and Reconciliation. After rescuing the Captain, Cortana learns that Halo appears to be a weapon that holds great religious significance to the Covenant. Realizing that the Covenant cannot be allowed to control Halo, Keyes dispatches John-117 to secure Halo's control room while he leaves with Johnson to secure a Covenant weapons cache. With UNSC Marines as support, John-117 leads an assault on the Silent Cartographer, a map room which holds information on every location on the ring, including the control room. Heading to the ring's control room, Cortana is inserted into the ring's computer system and learns that Halo was made by the Forerunners, an ancient alien race that the Covenant worship as gods. However, Cortana soon learns that there is something else on Halo, something that terrifies the Covenant. Frightened, she says that John has to stop Keyes from accessing the "weapons cache" before it is too late. John-117 leaves for the last spot where Captain Keyes and Sergeant Johnson's squad were seen, an underground facility in a swamp. He finds evidence of battle all over the facility, and soon finds a recording of one Marine, which details Keyes' squad encountering a new threat: the Flood. The Flood is a parasitic species which received their name due to the way they assimilate all resistance with overwhelming numbers. Free for the first time in a hundred thousand years, the Flood sweeps across Halo, devastating Human and Covenant forces alike. The release of the Flood prompts 343 Guilty Spark, the eccentric AI Monitor of the ring, to activate Halo's defense systems. The AI instructs the SPARTAN-II to activate Halo by obtaining the Activation Index from the Installation's Library. The Chief does so, battling hordes of Flood along the way, and returns to the control room. Before Halo initiates its systems, Cortana intervenes and tells John the truth about the Forerunner structure and its purpose- Halo was designed to eliminate the Flood threat by starving the Flood of any life source large enough to sustain them; when fired, it would essentially wipe out all sentient life in the galaxy. Realizing the threat of Halo, Cortana instructs John-117 to detonate the Autumn's fusion reactor. This detonation would result in the destruction of Halo, which was against 343 Guilty Spark's protocol. Before doing so, the two sabotage three generators needed to power Halo, which buys them enough time to locate Captain Keyes, now succumbed to the Flood, and steal his neural implants to operate the Autumn. After battling his way through scattered and disorganized Covenant forces, the spreading Flood, and the Sentinels under direct command of 343 Guilty Spark, John-117 successfully overloads the ship's engine, and he and Cortana evacuate from Halo in a Longsword before the Autumn's engine detonates and destroys Halo. The pair appears to be the only survivors, and John-117 realizes that they are simply beginning a harrowing battle. Halo: Combat Evolved's gameplay was characterized by several features which set it apart from less acclaimed first-person shooter games of its time. Storyline execution: Halo: Combat Evolved's gameplay and storyline are tightly interwoven, delivered in a convincing manner consistent with the flow of the game. Vehicular incorporation: Halo: Combat Evolved's includes the option for players to control multiple land and air based vehicles in third-person view. This vantage brings a welcomed sense of immersion and enhances specific points of gameplay, again setting Halo apart from contemporary first person shooters. Weapons system: Halo: Combat Evolved's new weapons system is unique in two major respects. The first is only allowing players to carry two weapons at a time, thus forcing the player to make trade-offs as they progress throughout the game. The second is a single, separate button for throwing grenades, making them much more significant in both campaign and multiplayer games. Artificial intelligence: Halo: Combat Evolved's AI is quite sophisticated for its era. With a brand new advanced AI system, actions performed by the AI such as panicking after the death of a superior, diving out of the way of an oncoming vehicle, or taking cover from explosives and suppressive fire, helped Halo stand out from the rest of the first-person shooters being released at the time. Movement in Halo is similar to other first-person shooters, allowing the player to move forwards, backwards, and strafe left and right (including diagonally) independently of their aim. On the Xbox, moving and aiming are normally separated between the two analogue sticks, and on the PC, between the keyboard and the mouse. Halo also allows the player to crouch and jump, although jumping from a high ledge will often result in death, or at least major fall damage. Damage from falling can be reduced or negated entirely with a well-timed crouch right as one lands. Additionally, if the player crouches at the peak of his jump, he will be able to land on something slightly taller than if he were to jump without crouching. Also, if the player is jumping from a cliff he can make sure he is touching the wall periodically while he is falling. This will count as if he is touching floor, and every time the player touches the wall, the damage counter goes to zero (there is no visible damage counter during gameplay). Halo: Combat Evolved features a wide variety of environments including human and Covenant star ships, ancient buildings on Halo itself, and expansive outdoor climates. The first level, Pillar of Autumn, is fought entirely on the human star ship of the same name. The next level, Halo, takes place in a temperate highland climate with open-air Forerunner structures scattered about. This level also contains the famous "Blue Beam Towers". Truth and Reconciliation begins in a rocky desert, but the setting changes to the titular Covenant cruiser about one-third of the way through. The Silent Cartographer occurs on a tropical island, with substantial combat both outdoors and inside futuristic Forerunner installations. Assault on the Control Room takes place in a snowy, icy area of towering cliffs and underground tunnels as well as high-tech suspension bridges and oft-repeated Forerunner structures built into and through cliff walls. 343 Guilty Spark is a significant departure from these majestic environments, with combat in gloomy, exotic swamps and equally gloomy underground complexes that host the player's introduction to the Flood. The player is then teleported to the second of three entirely indoor levels, The Library, encountering repetitive, forbidding hallways and massive elevators. Master Chief returns to the snowy climate of Assault on the Control Room for Two Betrayals, visiting almost no new areas but, interestingly, traveling in the opposite direction. Keyes occurs in the same Covenant ship from Truth and Reconciliation, albeit now heavily damaged, but this time the Flood are present in huge numbers. Finally, The Maw is set on the Pillar of Autumn with three major differences: the presence of the Flood, the heavy structural damage, and access to the Engineering section and service corridors of the ship, which were previously off-limits. In total, six of the ten levels feature a substantial amount of combat outdoors. In Halo: Combat Evolved, the player has a limited, non-regenerating health, which can be fully restored by picking up health packs. Running completely out of health will result in death, but having lower health does not impede player actions. A player's health can be reduced only if his shields have been depleted. If the player's health is at minimal levels they will faintly hear John-117's heartbeat. Serving as the first layer of protection is the shielding system specially built for the MJOLNIR Mk. V armor. The shield will decrease in strength every time it is hit by a weapon and will fail after taking too many hits or freefall from certain altitude. The amount of shield drain depends on the attacker's weapon but will quickly regenerate if it is not hit for a brief period of time. The shield represents a marked departure from most first-person shooters, in which one's health bar is basically augmented by picking up "armor". In Halo: Combat Evolved, splatter kills are an easy task for all vehicles. With a simple touch, most characters, including John-117 and Hunters can die instantly. This also includes the Shade Turret; if the Turret moves and hits someone, the victim will die instantly. Fall damage also has limits; if falling speed exceeds the maximum shield and health cap, the player will be killed instantly, regardless of whether they are touching a wall in the environment, though the damage can be nullified if player is using vehicles, unless out of bounds. Scorpion tanks and Warthogs are invulnerable to any attack, with damage taken to both vehicles will be sustained by driver. Ghosts and Banshees, however, can be destroyed if the pilot is mounting it. The campaign in Halo: Combat Evolved can be played by single-player or cooperatively. In cooperative play, the second player takes control of an identical copy of the Master Chief. This second player, however, will not appear in any cutscene in the game. The Pillar of Autumn - "Escape intact as Covenant forces board your ship." Halo - "Seek out surviving Marines and help them fight the Covenant." The Truth and Reconciliation - "Board a Covenant ship in an attempt to rescue Captain Keyes." The Silent Cartographer - "Search for the map room that will lead you to the secrets of Halo." Assault on the Control Room - "Defend the Control Room against wave after wave of Covenant troops." 343 Guilty Spark - "Creep through a swamp to meet the only enemy the Covenant fear." The Library - "Fight your way through an ancient security facility in search of the Index." Two Betrayals - "Re-activate the weapon at the heart of Halo... and learn the truth." Keyes - "Stage a one-cyborg assault on a Covenant ship and bring back the Captain." The Maw - "Destroy Halo before Halo destroys all life in the galaxy." Up to four players can play together using the same-console splitscreen mode. It is also possible for up to 16 players to play together in one Halo game over a local area network, using Xbox and/or Xbox 360 consoles that have been connected through an ethernet hub, or via Xbox Connect. The game's seamless support for this type of play, and a few large maps that can accommodate up to 16 combatants, is a first for console games. Since the game was released before the launch of Xbox Live, mainstream online play was not available for this title. The old heads-up display and a Halo that has fallen under disrepair. This design was eventually incorporated into Halo 3. On July 21, 1999, during the Macworld Conference & Expo, Steve Jobs announced that Halo would be released for Mac OS and Windows simultaneously. Before this public announcement, game industry journalists under a non-disclosure agreement had previewed the game in a private showing during E3 1999, and were reportedly amazed. Bungie Studios later stated an even earlier development build of the game centered on real-time strategy and was "basically Myth in a sci-fi universe." At E3 2000, the first trailer of Halo was well-received. The version shown there differed greatly from the one exhibited previously, marking the first major overhaul in the game's development. At this point, Halo was a third-person action game, in which a transport starship crashlands on a mysterious ring world that orbits a star. Early versions of Covenant aliens appear in great numbers and loot what they can, and war erupts between them and the humans. Unable to match the technologically advanced alien race, the humans on the ring world resort to guerrilla warfare. This version of the game featured Halo-specific fauna, which were later dropped because of design difficulties and the creatures' "detract from the surprise, drama and impact of the Flood." Microsoft announced on June 19, 2000 that it had acquired Bungie Studios. Halo became an exclusive game for Microsoft's Xbox, and Bungie Studios rewrote the game's engine, heavily altering its presentation and turning it into a first-person shooter. Originally a key element, the game's online multiplayer component was dropped because Xbox Live would be unfinished at the time of Halo's release. While a playable demonstration of the game at Gamestock 2001 was well-received, critics had mixed reactions to its exhibition at E3 2001. Roughly 90% of the final product was developed in just nine months of development, with team members working 16-20 hours a day for six days per week between January and October of 2001. The novel Halo: The Fall of Reach by Eric Nylund was commissioned by Microsoft to serve as a prequel to Halo: Combat Evolved. During the writing of The Fall of Reach, Bungie reportedly almost cancelled the novel but was convinced by Eric S. Trautmann to approve it in exchange for himself, Matt Soell and Brannon Boren writing an estimated "80 percent" of the in-game dialogue of Halo: Combat Evolved. The dysfunctional relationship between Bungie and the Microsoft team working on the game created some disconnect - the notorious "this cave is not a natural formation" line was caused by Bungie promising that the environment would not be immediately obvious as an artificial formation. According to Trautmann, a number of Bungie employees resented the presence of Microsoft employees. The game was released in North America simultaneously with the Xbox, on November 15, 2001; the "Combat Evolved" subtitle was an addition by marketers at Microsoft, who felt that Halo alone was not a descriptive enough title to compete with other military-themed games. Halo's soundtrack was created by Bungie Studios' audio director, Martin O'Donnell, and received a large amount of praise from many critics. Martin O'Donnell has stated that his goal was to provide "a feeling of importance, weight, and sense of the 'ancient'." He designed the music so that it "could be dissembled and remixed in such a way that would give [him] multiple, interchangeable loops that could be randomly recombined in order to keep the piece interesting as well as a variable length". Development involved the creation of "alternative middle sections that could be transitioned to if the game called for such a change (i.e. less or more intense)." Martin O'Donnell has remarked that he "sat with the level designers and 'spotted' the level as though it was a movie, with the knowledge that the music would have to be malleable rather than static... [T]he level designer would tell me what he hoped a player would feel at certain points or after accomplishing certain tasks". Based on this information, O'Donnell would "go back and develop appropriate music cues, then have the designer script the cues into the level, and then we'd play through it to see if it worked as desired." He explained that the use of music in Halo is sparse because he believes that "[music] is best used in a game to quicken the emotional state of the player and it works best when used least", and that "[if] music is constantly playing it tends to become sonic wallpaper and loses its impact when it is needed to truly enhance some dramatic component of game play." 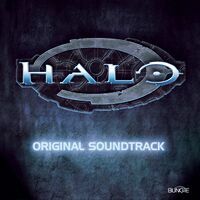 Halo: Original Soundtrack, composed and produced by Martin O'Donnell and Michael Salvatori for the video game Halo: Combat Evolved, is one CD comprising 26 tracks. Some editions include a bonus DVD with game trailers for Halo 2. Most of the music from Halo: Combat Evolved is present on the CD, although some songs are remixed and some tracks are intermixed with others in medley form. It was released in 2001. In 2000 at E3, Bungie showed off a trailer of the upcoming game to the public. This trailer featured Marines along with the Master Chief scouting out a Forerunner structure and the Covenant fighting them. During this trailer there was still no active AI so all the Covenant was actually controlled by Bungie. This trailer was before the conversion to the Xbox as an FPS. Before Halo: Combat Evolved was released, a series of cryptic emails were sent to marathon.bungie.org. The emails were supposedly written by Cortana, but the contents written were greatly out of her character. Her hacking skills, however, were shown, having some of the messages from other email accounts and even from the 1.3 version of the Bungie game Myth: The Fallen Lords CD. These messages provided a small glimpse of the Halo Trilogy plot. The game shipped with a game disk, and a manual detailing how to play the game and why everything is happening so far in the story. Halo was the main launch title for Xbox and is said to be the game that made the Xbox what it is today. It was widely renowned for saving the fledgling Xbox platform, as the Xbox lacked any titles to compete with Sony's PlayStation 2 or Nintendo's GameCube. Halo became an overnight success and managed to drive the platform from the brink of an early death. It went on to sell 6.43 million copies; in other words, 26% of all Xbox owners also owned Halo. It was also critically acclaimed. IGN gave the game a 9.7 out of 10 and stated it to be the best Xbox game of all time. X-Play gave it a perfect 5 out of 5. The game got a perfect ten from EGM, and was 2002 Game of the Year for IGN, EGM, OXM, and AIAS. It got a 9.5 out of 10 from Game Informer, and an average meta-score of 97 out of 100, making it the most highly rated Xbox game of all time. It also got a score of 9.0 for the PC version and 9.7 for the Xbox version from Gamespot. It was also called the game that reinvented a genre. OXM rated Halo: CE Number 1 in a list of the 100 best games of recent memory, saying "The Xbox did not create Halo, Halo made the Xbox". 2003 - Rereleased for PC and Mac platforms as Halo PC. 2004 - Rereleased as part of Action Double Pack which included Brute Force and Halo: Combat Evolved. 2005 - Rereleased as part of the Halo Triple Pack which contained Halo: Combat Evolved, Halo 2, and Halo 2 Multiplayer Map Pack. 2007 - Rereleased as part of the Halo History Pack (Japan only), which contained Halo: Combat Evolved, Halo 2, and a sneak peek of Halo 3, and as part of Xbox LIVE's Xbox Originals. 2011 - Remade as Halo: Combat Evolved Anniversary to tie in with Halo's tenth anniversary. 2014 - Rerelease of Anniversary as part of Halo: The Master Chief Collection on Xbox One, with the original Halo multiplayer compatible for the first time ever with console matchmaking. Halo: Combat Evolved was not the original title made by Bungie; the original title of the game had always been intended to be simply "Halo". 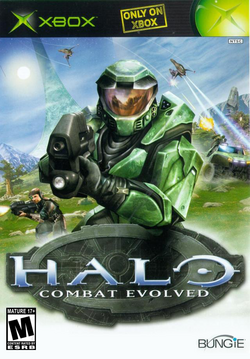 The subtitle "Combat Evolved", which Bungie has stated they "hated", was suggested by Microsoft Game Studios during the Halo's development phase in order to make the title more descriptive and indicative of a shooter game. There are 8,087 lines of dialog, most of them randomly triggered during combat. The Halo: Combat Evolved box art shows the Banshees in the background in their pilotless stance, yet they are still flying. Similarly, they are shown firing thin beams, rather than the bolts that they actually fire in-game. Halo: Combat Evolved was originally going to have most of the weapons that were introduced in Halo 2 and Halo 3, but due to time constraint, most of the weapons were cut from the final version. In the game's manual, the plasma rifle's blueprint is an overlap of a needler underneath and the rifle on top. Halo was originally planned to have a changing weather system which was mentioned in the August 2000 issue of PC Gamer magazine. The "Japan" cover for the game. The "Platinum Hits" cover for the game. A promotional image for the game. Image used to promote Halo: Combat Evolved. Image used to promote the game. ↑ PC Gamer: Your first look at... "Halo"
↑ halo.bungie.org: Frequently Asked Questions about "Halo"
↑ halo.bungie.org: "Next Generation Magazine"
↑ halo.bungie.org: Producing Audio for "Halo"